This is a no-compromise vegan cinnamon bun recipe. They’re rich, gooey and tender. These cinnamon buns are better than you’ll find in most bakeries. Seriously. Nobody would ever suspect they’re vegan. In the bowl of a stand mixer, combine the warm water with the pinch of sugar, then add the yeast. Let sit until foaming, about 5-10 minutes. In a small bowl, heat the soy milk with the 3 Tbsp coconut oil, until the oil melts. Add to the yeast mixture, along with the 3 Tbsp sugar and coconut cream. Stir to combine. Add the salt and flour. Knead with the dough hook for a few minutes, adding extra flour if required. The dough should come together and not stick to the bowl (only slightly tacky to the touch). Coat with oil, cover with plastic wrap, and let sit in a warm place until doubled in bulk, about 1 hour. Grease a 9×13-inch baking pan or casserole pan with coconut or vegetable oil. A baking sheet can also be used, but the buns around the edge will get crispier and less tender. In a small bowl, combine the 1/3 cup sugar, cinnamon and other spices. Set aside. Punch down the dough. On a lightly-floured surface, roll the dough into a 10×16-inch rectangle. Brush the dough with the melted coconut oil. Sprinkle filling evenly over dough. Roll the dough tightly along the long edge. With a serrated knife, trim the ends, and cut into 12 equal slices. Arrange in the baking dish, leaving about 1/2-inch between buns. Cover with a clean tea towel and let rest in a warm area until doubled in bulk, about 30 minutes. Brush top of buns with soy milk. Bake until tops are golden brown, about 24 minutes. Let cool slightly before icing. Place the icing sugar in a medium bowl, and whisk in 3 Tbsp of the soy milk, the coconut oil and vanilla. If too thick, add the remaining 1 Tbsp soy milk. 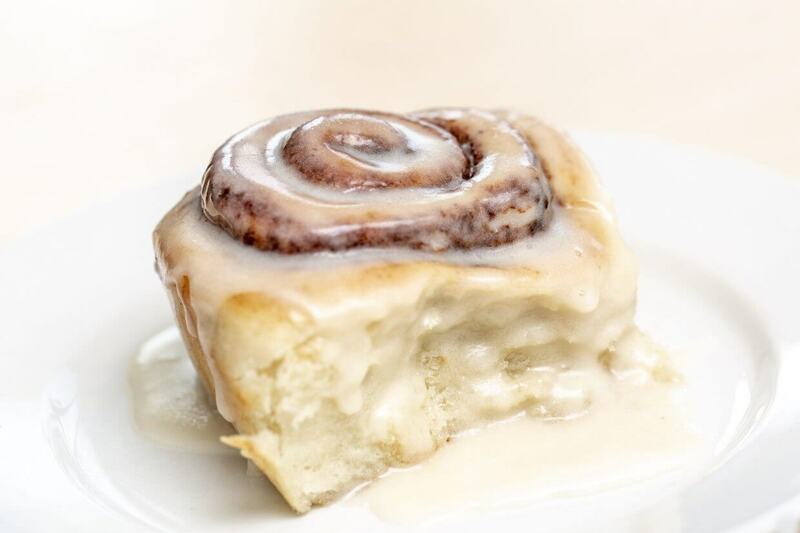 Pour the icing over the cinnamon buns. Each cinnamon buns contains approximately 288 calories, 11g fat (9g saturated), 45g carbohydrates (28g sugar), 3g protein and 78mg sodium. Trans-fat-free and cholesterol-free.